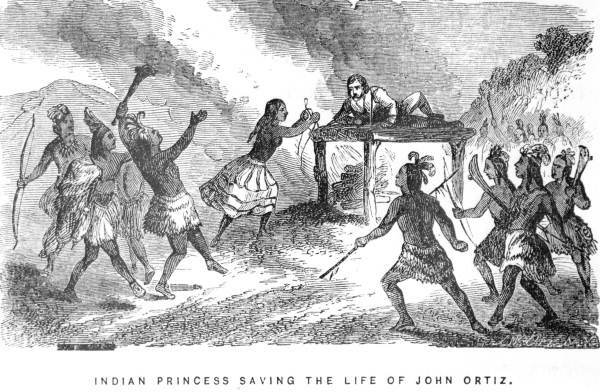 Princess Uleyli begs her father, Chief Ucita, to spare Juan Ortiz’s life. From the book Uleyli: The Princess & Pirate. When Hernando de Soto landed in southwest Florida to begin his exploration of the Southeast, he did so without the aid of his local native interpreters who had escaped upon sighting land. This would certainly have doomed the expedition but as luck would have it De Soto found a Spanish captive named Juan Ortiz who had been living among the Indians for 12 years and who knew their languages well. De Soto now could proceed with greater confidence into his ruthless exploration of this unknown land. Below is the story of the discovery of Juan Ortiz and of the time he spent among the Indians of La Florida. It serves as an important eyewitness account of Native American customs at the time of first contact. From A Narrative of the Expedition of Hernando de Soto Into Florida, by a Gentleman of Elvas PUBLISHED AT EVORA 1557. TRANSLATED FROM THE PORTUGUESE BY RICHARD HACKLUYT. LONDON, 1609. On Sunday the 18th of May, in the year of our Lord 1539, the Adelantado or president departed from Havana in Cuba with his fleet, which were nine vessels, five great ships, two caravels, and two brigantines. They sailed seven days with a prosperous wind. The 25th day of May, the day de Pasca de Spirito Santo[D] (which we call Whitson Sunday), they saw the land of Florida, and because of the shoals, they came to an anchor a league from the shore. 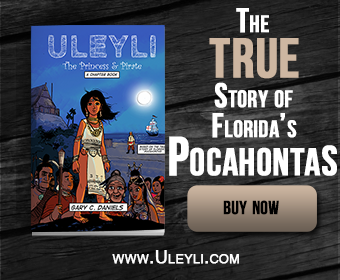 On Friday the 30th of May they landed in Florida, two leagues from a town of an Indian lord called Ucita. They set on land two hundred and thirteen horses, which they brought with them to unburden the ships, that they might draw the less water. He landed all his men, and only the seamen remained in the ships, which in eight days, going up with the tide every day a little, brought them up unto the town. As soon as the people were come on shore, he pitched his camp on the sea-side, hard upon the bay which went up unto the town. And presently the Captain-general, Vasquez Porcallo, with other seven horsemen foraged the country half a league round about, and found six Indians, which resisted him with their arrows, which are the weapons which they used to fight withal. The horsemen killed two of them, and the other four escaped; because the country is cumbersome with woods and bogs, where the horses stuck fast, and fell with their riders, because they were weak with traveling upon the sea. The same night following, the Governor with an hundred men in the brigantines lighted upon a town, which he found without people, because that as soon as the Christians had sight of land, they were descried, and saw along the coast many smokes, which the Indians had made to give advice the one to the other. The next day Luys de Moscoso, master of the camp, set the men in order, the horsemen in three squadrons, the vanguard, the battalion, and the rereward; and so they marched that day and the day following, compassing great creeks which came out of the bay. They came to the town of Ucita, where the Governor was on Sunday the first of June, being Trinity Sunday. The town was of seven or eight houses. The lord’s house stood near the shore upon a very high mount, made by hand for strength. At another end of the town stood the church, and on the top of it stood a fowl made of wood with gilded eyes. Here were found some pearls of small value, spoiled with the fire, which the Indians do pierce and string them like beads, and wear them about their necks and handwrists, and they esteem them very much. The houses were made of timber, and covered with palm leaves. The Governor lodged himself in the lord’s houses, and with him Vasquez Porcallo, and Luys de Moscoso; and in others that were in the midst of the town, was the chief Alcalde or justice, Baltasar de Gallegos lodged; and in the same houses was set in a place by itself all the provision that came in the ships; the other houses and the church were broken down, and every three or four soldiers made a little cabin wherein they lodged. The country round about was very fenny, and encumbered with great and high trees. The Governor commanded to fell the woods a crossbow shot round about the town, that the horses might run, and the Christians might have the advantage of the Indians, if by chance they should set upon them by night. In the ways and places convenient they had their sentinels of footmen by two and two in every stand, which did watch by turns, and the horsemen did visit them, and wereready to assist them if there were any alarm. The Governor made four captains of the horsemen and two of the footmen. The captains of the horsemen were one of them Andrew de Masconcelos, and another Pedro Calderan de Badajoz; and the other two were his kinsmen, to wit, Arias Tinoco, and Alfonso Romo, born likewise in Badajoz. The captains of the footmen, the one was Francisco Maldonado of Salamanca, and the other Juan Rodriguez Lobillo. While we were in this town of Ucita, the two Indians which John Danusco had taken on that coast, and the Governor carried along with him for guides and interpreters, through carelessness of two men which had the charge of them escaped away one night; for which the Governor and all the rest were very sorry, for they had already made some roads, and no Indians could be taken, because the country was full of marsh grounds, and in some places full of very high and thick woods. From the town of Ucita the Governor sent the Alcalde mayor, Baltasar de Gallegos, with forty horsemen and eighty footmen into the country to see if they could take any Indians; and the Captain John Rodriguez Lobillo another way with fifty footmen: the most of them were swordsmen and targeters, and the rest were shot and crossbow-men. They passed through a country full of bogs, where horses could not travel. Half a league from the camp they lighted upon, certain cabins of Indians near a river. The people that were in them leaped into the river, yet they took four Indian women. And twenty Indians charged us and so distressed us, that we were forced to retire to our camp, being, as they are, exceeding ready with their weapons. It is a people so warlike and so nimble, that they care not a whit for any footmen. For if their enemies charge them they run away, and if they turn their backs they are presently upon them. And the thing that they most flee is the shot of an arrow. They never stand still, but are always running and traversing from one place to another, by reason whereof neither crossbow nor arquebuss can aim at them; and before one crossbowman can make one shot an Indian will discharge three or four arrows, and he seldom misseth what he shooteth at. An arrow where it findeth no armor, pierceth as deeply as a crossbow. Their bows are very long, and their arrows are made of certain canes like reeds, very heavy, and so strong that a sharp cane passeth through a target. Some they arm in the point with a sharp bone of a fish like a chisel, and in others they fasten certain stones like points of diamonds. For the most part when they light upon an armor they break in the place where they are bound together. Those of cane do split and pierce a coat of mail, and are more hurtful than the other. John Rodriguez Lobillo returned to the camp with six men wounded, whereof one died; and brought the four Indian women which Baltasar Gallegos had taken in the cabins or cottages. Two leagues from the town, coming into the plain field, he espied ten or eleven Indians, among whom was a Christian, which was naked and scorched with the sun, and had his arms razed after the manner of the Indians, and differed nothing at all from them. And as soon as the horsemen saw them they ran toward them. The Indians fled, and some of them hid themselves in a wood, and they overtook two or three of them which were wounded; and the Christian seeing a horseman run upon him with his lance, began to cry out, “Sirs, I am a Christian, slay me not, nor these Indians, for they have saved my life.” And straightway he called them and put them out of fear, and they came forth of the wood unto them. The horsemen took both the Christian and the Indians up behind them, and toward night came into the camp with much joy; which thing being known by the Governor, and them that remained in the camp, they were received with the like. This Christian’s name was John Ortiz, and he was born in Seville, of worshipful parentage. He was twelve years in the hands of the Indians. He came into this country with Pamphilo de Narvaez, and returnedin the ships to the Island of Cuba, where the wife of the Governor Pamphilo de Narvaez was, and by his commandment with twenty or thirty others in a brigantine returned back again to Florida, and coming to the port in the sight of the town, on the shore they saw a cane sticking in the ground, and riven at the top, and a letter in it; and they believed that the governor had left it there to give advertisement of himself when he resolved to go up into the land, and they demanded it of four or five Indians which walked along the sea-shore, and they bade them by signs to come on shore for it, which against the will of the rest John Ortiz and another did. And as soon as they were on land, from the houses of the town issued a great number of Indians, which compassed them about and took them in a place where they could not flee; and the other, which sought to defend himself, they presently killed upon the place, and took John Ortiz alive, and carried him to Ucita their lord. Andthose of the brigantine sought not to land, but put themselves to sea, and returned to the Island of Cuba. 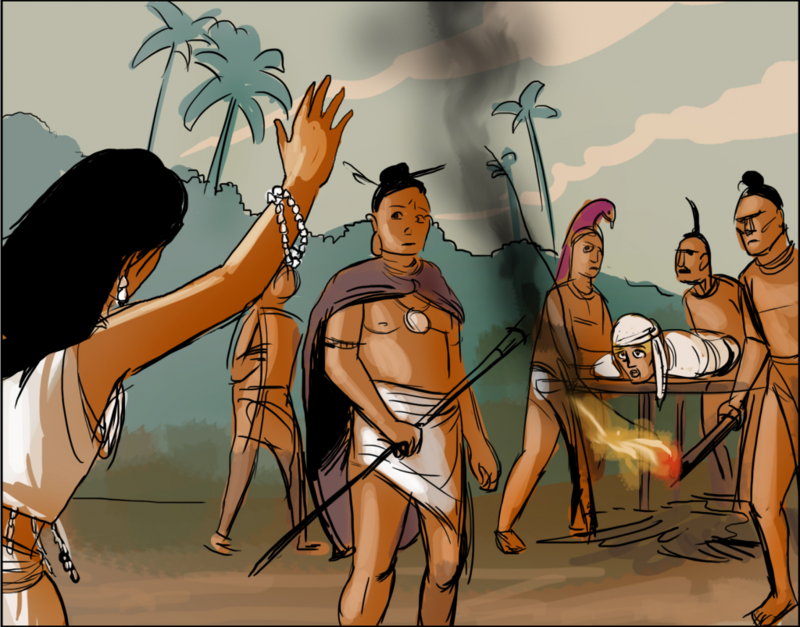 Ucita commanded to bind John Ortiz hand and foot upon four stakes aloft upon a raft, and to make a fire under him, that there he might be burned. But a daughter of his desired him that he would not put him to death, alleging that one only Christian could do him neither hurt nor good, telling him that it was more for his honor to keep him as a captive. And Ucita granted her request, and commanded him to be cured of his wounds; and as soon as he was whole he gave him the charge of the keeping of the temple, because that by night the wolves did carry away the dead corpses out of the same—who commended himself to God and took upon him the charge of his temple. One night the wolves got from him the corpse of a little child, the son of a principal Indian, and going after them he threw a dart at one of the wolves, and struck him that carried away the corpse, who, feeling himself wounded left it, and fell down dead near the place; and he not woting what he had done, because it was night, went back again to the temple; the morning being come and finding not the body of the child, he was very sad. As soon as Ucita knew thereof he resolved to put him to death, and sent by the track which he said the wolves went, and found the body of the child, and the wolf dead a little beyond, whereat Ucita was much contented with the Christian, and with the watch which he kept in the temple, and from thenceforward esteemed him much. Three years after he fell into his hands there came another lord called Mocoço, who dwelleth two days’ journey from the port, and burnt his town. Ucita fled to another town that he had in another sea-port. Thus John Ortiz lost his office and favor that he had with him. These people being worshipers of the devil, are wont to offer up unto him the lives and blood of their Indians, or of any other people they can come by; and they report that when he will have them do that sacrifice unto him, he speaketh with them, and telleth them that he is athirst, and willeth them to sacrifice unto him. John Ortiz had notice by the damsel that had delivered him from the fire, how her father was determined to sacrifice him the day following, who willed him to flee to Mocoço, for she knew that he would use him well; for she heard say that he had asked for him and said he would be glad to see him, and because he knew not the way she went with him half a league out of the town by night and set him in the way, and returned because she would not be discovered. John Ortiz traveled all that night, and by the morning came to a river which is the territory of Mocoço, and there he saw two Indians fishing; and because they were in war with the people of Ucita, and their languages were different, and he knew not the language of Mocoço, he was afraid, because he could not tell them who he was, nor how he came thither, nor was able to answer anything for himself, that they would kill him, taking him for one of the Indians of Ucita, and before they espied him he came to the place where they had laid their weapons; and as soon as they saw him they fled toward the town, and although he willed them to stay, because he meant to do them no hurt, yet they understood him not, and ran away as fast as ever they could. And as soon as they came to the town with great outcries, many Indians came forth against him, and began to compass him to shoot at him. John Ortiz seeing himself in so great danger, shielded himself with certain trees, and begun to shriek out and cry very loud, and to tell them that he was a Christian, and that he was fled from Ucita, and was come to see and serve Mocoço his lord. It pleased God that at that very instant there came thither an Indian that could speak the language and understood him, and pacified the rest, who told them what he said. Then ran from thence three or four Indians to bear the news to their lord, who came forth a quarter of a league from the town to receive him, and was very glad of him. He caused him presently to swear according to the custom of the Christians, that he would not run away from him to any other lord, and promised him to entreat him very well; and that if at any time there came any Christians into that country, he would freely let him go, and give him leave to go to them; and likewise took his oath to perform the same according to the Indian custom. About three years after certain Indians, which were fishing at sea two leagues from the town, brought news to Mocoço that they had seen ships, and he called John Ortiz and gave him leave to go his way, who taking his leave of him, with all the haste he could came to the sea, and finding no ships he thought it to be some deceit, and that the cacique had done the same to learn his mind. So he dwelt with Mocoço nine years, with small hope of seeing any Christians. As soon as our Governor arrived in Florida, it was known to Mocoço, and straightway he signified to John Ortiz that Christians were lodged in the town of Ucita; and he thought he had jested with him as he had done before, and told him that by this time he had forgotten the Christians, and thought of nothing else but to serve him. But he assured him that it was so, and gave him license to go unto them, saying unto him that if he would not do it, and if the Christians should go their way, he should not blame him, for he had fulfilled that which he had promised him. The joy of John Ortiz was so great, that he could not believe that it was true; notwithstanding he gave him thanks, and took his leave of him, and Mocoço gave him ten or eleven principal Indians to bear him company; and as they went to the port where the Governor was, they met with Baltasar de Gallegos, as I have declared before. As soon as he was come to the camp, the Governor commanded to give him a suit of apparel, and very good armor, and a fair horse; and inquired of him whether he had notice of any country where there was any gold or silver. He answered, No, because he never went ten leagues compass from the place where he dwelt; but that thirty leagues from thence[E] dwelt an Indian lord, which was called Paracossi, to whom Mocoço and Ucita, with all the rest of that coast paid tribute, and that he peradventure might have notice of some good country, and that his land was better than that of the sea-coast, and more fruitful and plentiful of maize. Whereof the Governor received great contentment, and said that he desired no more than to find victuals, that he might go into the main land, for the land of Florida was so large, that in one place or other there could not choose but be some rich country. The Cacique Mocoço came to the port to visit the Governor, and made this speech following. The Governor answered him, “That although in freeing and sending him the Christian, he had preserved his honor and promise, yet he thanked him, and held it in such esteem as it had no comparison; and that he would always hold him as his brother, and would favor all things to the utmost of his power.” Then he commanded a shirt to be given him, and other things, wherewith the cacique being very well contented, took his leave of him, and departed to his own town.